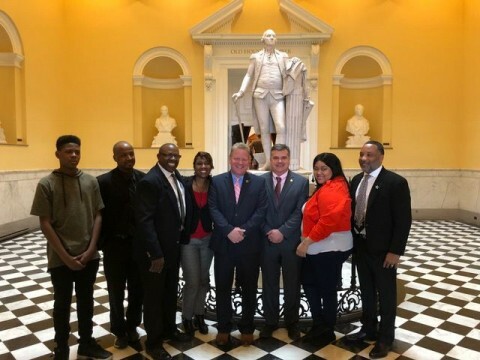 A cancer science center honoring the memory of Henrietta Lacks, an African-American woman who lived in Clover before her cells were used to create the first immortal human cell line, is on the way to become a reality in Halifax County, and on Wednesday Lacks’ legacy was honored from the floors of the Virginia House of Delegates and Senate. The Henrietta Lacks Life Science Center currently is conceived to be a $50 million, 200,000 square-foot, state-of-the-art medical research and treatment facility, to be built in the Halifax County Industrial Development Authority’s Southern Virginia Technology Park (SVTP), a short drive from Henrietta Lacks’ Clover home and final resting place. At the same time Wednesday, members of the Henrietta Lacks family and Henrietta Lacks Legacy Group were recognized by 20th District Senator William “Bill” Stanley and 60th District Delegate James Edmunds as part of efforts to bring to fruition the Henrietta Lacks Commission and Henrietta Lacks Life Science Center Project. Henrietta Lacks was born Loretta Pleasant on Aug. 1, 1920, but she quickly and affectionately came to be called Hennie by her family. After her mother’s death, she was raised by extended family members in the Clover community where she lived in a former slave cabin known to the Lacks family as the home-house, most of which still stands today, just yards away from Lacks’ final resting place. Edmunds told his colleagues in the House, Lacks was baptized in St. Matthews Church in the town of Clover and educated in the same town. As a child, Henrietta worked the exhausting life of a tobacco farmer’s daughter alongside her cousins. She later married and began her family in Clover. In 1941, Henrietta moved with her husband, David “Dye” Lacks, and their first two children, Lawrence and Elsie, to Turner Station, near Baltimore, Maryland. Edmunds explained they moved because of the unfairness of a culture and social system that gave little or no economic opportunity to African-Americans, and even less opportunity to an African-American woman. Her husband found work in the steel mills, and Lacks continued raising her growing family, which soon included another daughter, Deborah, and two more sons, David, known as “Sonny,” and Joseph, now known as Zakariyya. “Her children, grandchildren and great-grandchildren form Henrietta’s family legacy, which lives on and carries forward Henrietta’s broader, unique and world-changing legacy,” Edmunds said as he recognized six of Lacks’ descendants and extended family members in the chamber on Wednesday including Jeri Lacks Whye, David Lacks Jr., Devin Lacks, Thomas Whye, Alfred Carter Jr. and Veronica Robinson. Like many stories of triumph and healing, Edmunds said Lacks’ heroism started with tragedy and suffering. In 1951, she was diagnosed with cervical cancer and treated at Johns Hopkins in Baltimore. There, just before her untimely death at the young age of 31, and unbeknownst to her, some of her cells were removed from her body for use in research. “Also unbeknownst to the rest of the world at the time, was that we had all received a miraculous gift in the form of human cells that did not die. Henrietta Lack’s cells, shortened in name to HeLa cells, and so disconnecting her full name from their power and promise for over half a century, became the first immortal cell line,” the delegate said. HeLa cells have been used to research and develop new therapies to fight cancer and AIDS, and in the effort to map the human genome, that holds the key to “personalized medicine” which could treat or even cure everyone of almost every ailment and disease over time. “And now, because Henrietta Lacks’ loving and giving spirit flows through her family legacy, we in the Commonwealth of Virginia are being given the opportunity to honor her world legacy in ways long overdue, and in the place that she would have appreciated most, her homeplace — Southern Virginia, Halifax County, Virginia,” Edmunds said. Southern Virginia still has a statistically significant higher rate of certain cancers than any other place in the country, the delegate noted. “These need to be researched where they are most prominent and most deadly. Many Southern Virginians who suffer from cancer have to travel long distances to get certain treatments, adding insult to injury. They need to be treated where they live,” he added. On Wednesday in Richmond the family was joined by representatives of the Henrietta Lacks Legacy Group, based in Turner Station, and sanctioned by the family to advance Lacks’ legacy as they have done for more than 20 years. Members of the Legacy Group in attendance were Servant Courtney Speed, Elmira Thornton, Muriel Christian Gray, Alejandra Ivanovich and Adele Newson-Horst. Also present were local county leaders including Dr. Betty Adams, executive director of the Southern Virginia Higher Education Center, Halifax Mayor Kristy Johnson, who also serves as deputy director of the Halifax Industrial Development Authority, and Matt Leonard, executive director of the Halifax Industrial Development Authority, who developed the plan for the Henrietta Lacks Life Science Research and Cancer Treatment Center and have been promoting it for the last four years. Del. Edmunds urged the members of Virginia’s General Assembly to join this heroic effort. “This governing body, during this session, has considered and deliberated the formation of the Henrietta Lacks Commission, the purpose of which will be to create, build and see to sustainable operation the Henrietta Lacks Life Science and Cancer Treatment Center just a few short miles from where Henrietta lies in eternal rest, in Halifax County, Virginia. “Her heroic legacy, unrecognized by too many for too long, is not lost on this House of Delegates. We have voted to form and support this new commission, and along with our colleagues in the Senate, we have done so unanimously,” Edmunds said.